The answers in "This file came from another computer..." - how can I unblock all the files in a folder without having to unblock them individually? explain how to "Unblock" a file that came from a remote source. For testing purposes, I would like to accomplish the reverse. 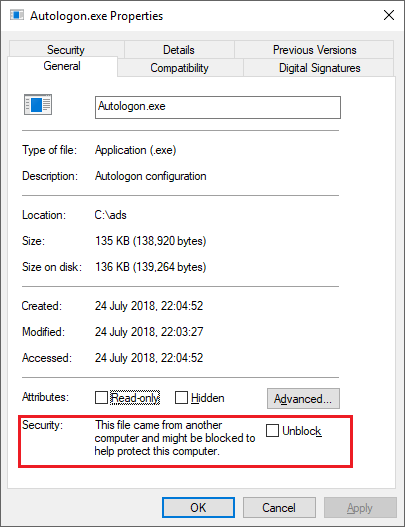 How do I set a file's zone identifier so that Windows will "block" it? I'm partial to a PowerShell solution, but other mechanisms are acceptable. This additional data about the file is stored in an Alternate Data Stream (ADS). Alternate Data Streams can be viewed in a number of ways, with tools such as Streams but now more conveniently with PowerShell. For the purposes of this question, it is the Zone.Identifier stream that we are interested in. How to Make my Sisters Computer Absolutely Foolproof? Can a malicious program infect a computer from another computer on a typical home wireless network? Can you make one file reference another? How to use an XML file from another computer? How to completely delete programs that came with my computer?